Along with the X Men trilogy that was kick started in the late 90’s, the Spiderman trilogy is a bench mark in superhero film making and is arguably some of the most important films in the genre. These films, along with the X Men showed that there was money to be made in the comic book movie genre, but they also showed that these types of films can be more than just kids films. Firstly, Sam Raimi is the director of the Spiderman trilogy, and that matters a lot. These films aren’t made by some hack director like many other films of the genre, directors who were hired simply on the fact that they were competent. Unlike these directors, Raimi has a clear style and presence throughout the film and many moments in the film hark back to his early work, such as the Evil Dead trilogy. This really helps as it makes the viewer feel the director actually wants to be there, that he’s putting his own visual touches on the film. Plus it means we get some awesome and unique moments from the mind of one of the best directors of all time. All of the films fight scenes are brilliant as well, and for my money the best of the entire trilogy. While the first film does have it share of brilliant choreographed CGI fights, the sort that were developed upon in the sequels, it also has some amazing practical work. 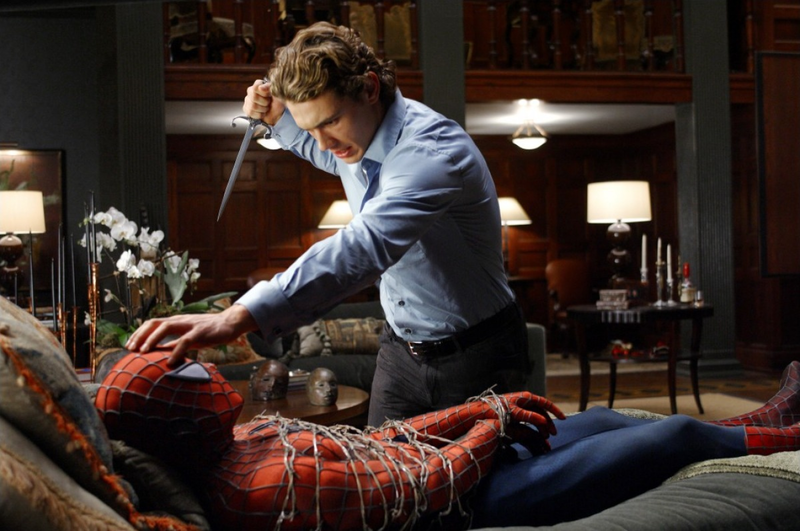 The finale of the film is almost entirely practical wire work and stunts between Spider-Man and Goblin, adding a sense of Raimi-ness to the film and adding a touch of brutality to the film that I think was lost in the sequels. The film does have a couple of problems, such as the slightly cheesy dialogue spouted by a few of the characters. But unlike The Amazing Spider-Man, which also has it’s fair share of corny dialogue, it feels fun and mostly believable in the original trilogy. Willem Dafoe is predictable great in the film and manages to chew the scenery as both the meek businessman Norman Osborn and as the brilliantly unhinged Green Goblin. 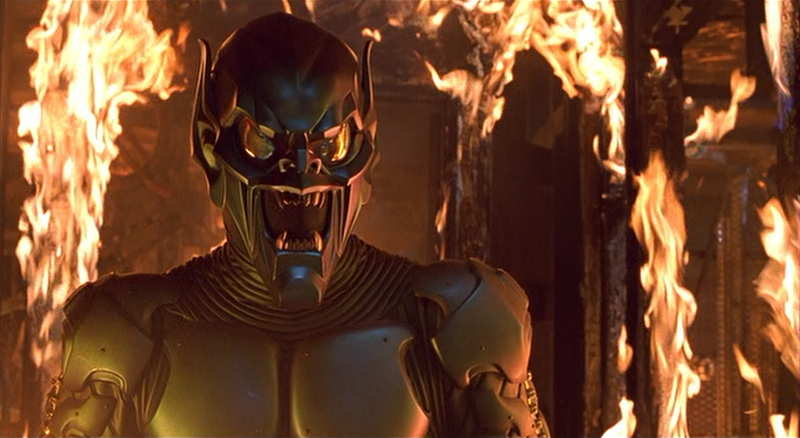 Unlike Dane DeHaan’s over the top Goblin in The Amazing Spider-Man 2, Dafoe’s portrayal fits within the weird world Raimi has created and is arguably the best portrayal of a Spider-Man villain on the big screen. Spider-Man works as both a perfect super hero origin movie and as just a really great film. While some of the writing is a little cheesy at times, it all works in the films favour. As well as that, the action scenes are great and the directing is top-notch. The characters are believable and most importantly, enjoyable, and the film has heart that is missing from the cold and sadly less camp reboot. If you’re a fan of the Spider-Man comics, superhero movies or just all around great films then I reckon you’ll love Spider-Man. Spider-Man’s back! This time with a new enemy to fight, the awesome Doctor Octopus. This film gets a lot of praise for not only being an excellent sequel, but for being an excellent superhero movie, and you can see why. This is how superhero movies should be done. Before all superheroes films had to be muted and gritty we got colourful and camp, and it’s SO much more fun. After the death of his father, Norman Osborn AKA Green Goblin, Harry is out blood. His target; Spider-Man. Having these two best friends turn against each other without realising it makes any scene with Peter and Harry in so much more interesting. Peter also has his love-life to worry about as he still has feelings for Mary-Jane. On top of this he has University to concentrate on, trying to keep his grades up whilst also being Spider-Man. As if his personal life wasn’t hectic enough, Peter also has Doctor Otto Octavius to deal with. It’s no wonder then that this stress in his personal life and the threat of a new villain takes its toll on Peter and he loses his powers. This is such a great element to mix things up in this sequel. Seeing Peter attempt to give up his life as the webslinger, albeit briefly, is very compelling to watch. Spider-Man 2 does everything a great sequel should, it’s keeps what made the first so brilliant and even expands on many elements, whilst also making the film feel new and interesting. It still speaks to everyone, with Peter struggling to balance his life as relationships and work get harder and harder. Overall, this is a downright excellent movie brimming with huge action sequences with heart and emotion to match. Note – We watched the Spider-Man 2.1 version of the film and some of the extended scenes were great. One scene between M.J. and her fried really added some depth to the relationship with her soon-to-be husband. Also there’s a funny scene with J. Jonah Jameson in the Spidey suit, which is as funny, weird and creepy as it sounds. Spider-Man is of course a trilogy, which means we had to watch Spider-Man 3. I was worried about this initially, what with all of the hate it gets. But after watching it again I was surprised at how good it was. I mean, it’s got a lot of problems but it’s by no means deserving of all the criticism it gets. The villains this time around are Harry Osborn’s New Goblin who knows Peter’s secret, the not so evil Flint Marko AKA Sandman and Eddie Brock, otherwise known as Venom. Now here lies the biggest problem. There are too many villains! The most interesting element of the film is with Harry/new Goblin, and this stuff really works in the film. Seeing Harry playing Peter and M.J. off against each other makes for an interesting film. The other elements…not so much. Sandman is great, and Thomas Haden-Church is excellent, putting in a really strong performance. But he doesn’t feel needed, he just gives the film a focus in the second act and gives Spidey another enemy to battle in the end. There’s also a sub-plot that reveals Flint killed Uncle Ben which ultimately just feels pointless, although it does lead to a nice scene between Spidey and Sandman at the end. Eddie Brock/Venom is a weak villain. I love Topher Grace in this movie. He’s so creepy and weird that he just makes every second he’s on screen be that more enjoyable. I’m not sure how intentional that was meant to be, but he really brings that slimy element to the film. His transformation into venom doesn’t take place until about twenty minutes from the end, and well it’s a disappointment. 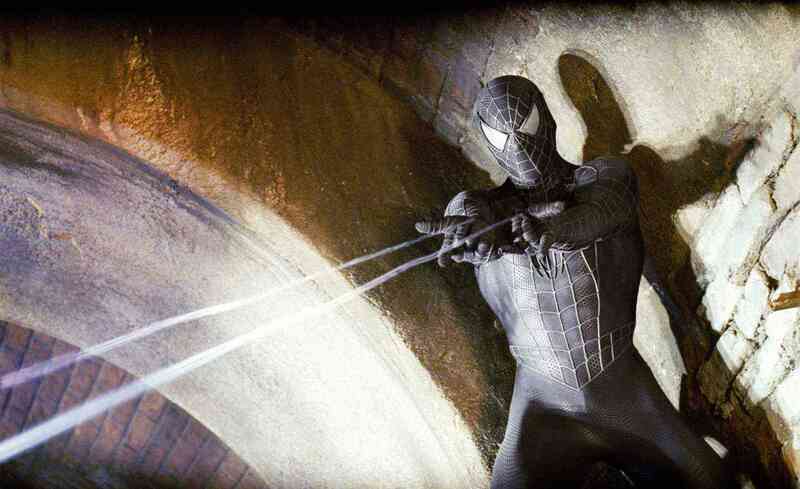 The big moment of the film is Peter’s transformation into the black suited Spider-Man. I think this is handled well. The symbiote amplifies personality traits and it turns Peter into the biggest douche ever. This is fun and I even enjoy that dancing scene. I think it’s and it isn’t as weird when watched in context with the rest of the movie. The famous scene in which newly douche-ified Peter ‘slaps’ M.J. amidst a bar brawl is a little awkward at times. Overall the film isn’t bad. it has it’s problems and it’s not as Sam Raimi-y as the previous two. It still feels like a Spider-Man film though and all of the supporting characters are great. Tobey Maguire still makes a better Spider-Man AND Peter Parker than Andrew Garfield and it still has heart, even if it does feel like the biggest cash grab of the three. The parts between Peter and Harry are the best bits in the movie but the action is awesome. Still worth the watch. The Spider-Man trilogy is excellent. Many are put off by how camp and silly it can be, but for me that’s exactly how a superhero film should be. The new Amazing Spider-Man feels like it’s got no heart to it, it’s just not fun. It feels like a group of people have sat down, looked at what’s popular and then churned out the most mediocre crowd-pleasing film possible. It doesn’t have the flair of these three, it doesn’t have the distinct feel that Sam Raimi brings to the table and it certainly doesn’t have the fun. It has Andrew Garfield being hipster-y and riding around on a skateboard. People can relate to Tobey Maguire’s Peter Parker, he feels like every nerdy teenager and that’s what makes these films so appealing. The Amazing Spider-Man will just never compare to this trilogy because they are just so good.